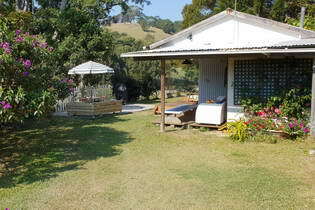 Byron Bay accommodation guide and tourist information, New South Wales, 2481, Australia. 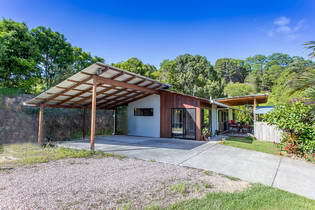 Byron Bay holiday guide for visitors with accomodation links, Byron Bay weather, How to get to Byron Bay NSW, Asutralia. Cape Byron and its famous lighthouse is as far east as you can walk in mainland Australia. Your next step will see you swimming with the surfers 200 metres below, unless that is, you are indulging in a tandem hang gliding session! Steady growth in tourism infrastructure over the years, has made it possible for Byron Bay accommodation and tour operators to provide "surf to rainforest" experiences to suit all budgets. There are numerous types of lodgings to choose from, including luxury holiday homes and resorts, affordable family resorts, B&Bs, motels, hotels, backpacker hostels, guesthouses, holiday cottages, and over a dozen caravan and camping parks. Big Volcano Supporters. Hint: Mouse over for external site description. External links open in a new window. For visitors travelling with their pets, there is a wide variety of pet friendly accommodation in the region, and local councils provide detailed information on Dog Exercise Areas and dog friendly places. Cafes, bistros and restaurants abound. The retail therapy is mind boggling, with many unique retail outlets supporting the artisans and crafts people of the district. For shopaholics, a visit to the Byron Arts and Industrial Estate is a must, showcasing the creative, unique and stylish fashions, arts and crafts inspried by the natural environment. A thriving "mind, body & spirit" culture can provide everything from a Thai massage through to reiki, yoga, meditation and float tanks, if that's your thing. For those with a more adventurous spirit, tandem skydiving and motorised gliding adventures and tuition, are available from near-by Tyagarah Airfield, while the Indoor Rock Climbing Centre will provide a different kind of challenge. Or you can learn how to hang ten from the best, and be able to boast that you went surfing at Byron! The International East Coast Blues & Roots Music Festival at Easter and the Byron Bay Writers Festival, in the last week of July, swell the ranks of visitors to Byron at these times. Cape Byron is one of the most popular places on the north coast for whale watching from June to September. Rather ironic, given that before its closure in 1962, the Byron Bay Whaling Station was one of four on the east coast catching and processing whales during the migration. 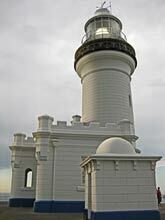 Cape Byron State Conservation Area includes the Cape Byron Lighthouse precinct and encompasses a conservation reserve of the surrounding headland. The Cape Byron Headland Reserve Trust manages an excellent information centre, and you can stroll from the lighthouse to the beach through the 47 hectares of protected remnant coastal vegetation communities. The clifftop walking track winds its way through diverse plant communities, offering panoramic views of the ocean and north coast hinterland, and the lookouts are great spots for spotting turtles and dolphins, and watching out for humpback whales on their annual migration. The Cape's lighthouse has stood on the most easterly point of the Australian mainland for more than a century, and these days you can take a tour of the tower. A vehicle entry fee to the Cape Byron Lighthouse precinct, and nearby car parks. Cape Byron Lighthouse Photo (below right) © courtesy of Dede Callichy - See Clearly. A major attraction inside the Cape Byron Marine Park, Julian Rocks Marine Reserve is a popular scuba diving location close to the mainland, and you can take scuba and kayaking lessons with experienced operators who are also knowledgable about the natural environment. The scenery here is awesome! So are the waves. But when you get water logged, sun burnt and bored with whales and dolphins, the cool shade of the "Big Scrub" remnant rainforests and nature reserves are waiting to be discovered. Stretching south along Tallow Beach from Cape Byron for nearly two kilometers, the creation of Arakwal National Park is the result of the first indigenous land use agreement in Australia. The area provides habitat for significant flora and fauna species, including wintering sites for nomadic and migratory birds, and is also home to the Cibum Margil Swamp, a declared coastal wetland. Right in downtown Byron, just off Butler Street you'll find the Cumbebin Wetland Sanctuary, while Broken Head Nature Reserve is just 15 minutes drive to the south. Or you can take a 4 wheel drive tour with a National Parks approved or ecotourism accredited tour operator to the World Heritage listed Border Group of the Gondwana Rainforests of Australia, only an hour's drive away through the pastures and macadamia plantations via Mullumbimby and Nimbin. Getting to the region is easy: Byron Bay is approximately 780 kilometres - about 10 hours drive north from Sydney and about 90 minutes drive south from Brisbane, via the Pacific Highway. Driving options include the Pacific Highway, New England Highway and Summerland Way in New South Wales, and Pacific Highway and the inland Mount Lindesay Highway route from Queensland. A variety of daily airport transfer services are available to selected localities in the region, and some also offer services to Brisbane International Airport. Daily coach services operate to Byron Bay from Brisbane, Sydney and Melbourne, and daily or overnight train from Sydney to Brisbane via coach transfer at Casino. Visit Byron Shire - Transport Services Information for more transport information, including trains, coach and local bus schedules, taxis, airport, and transfer services for Byron Bay and surrounding localities including Byron Arts & Industry Estate, Bangalow, Mullumbimby, Brunswick Heads, Ocean Shores, New Brighton, South Golden Beach and Billinudgel.